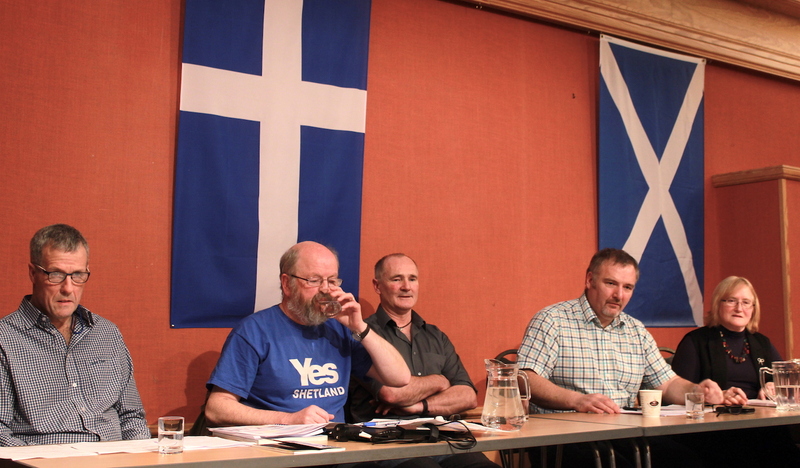 THERE was little doubt in the minds of the crowd that gathered at Islesburgh Community Centre in Lerwick on Saturday night that Britain’s exit from the European Union was a bad thing for Shetland. 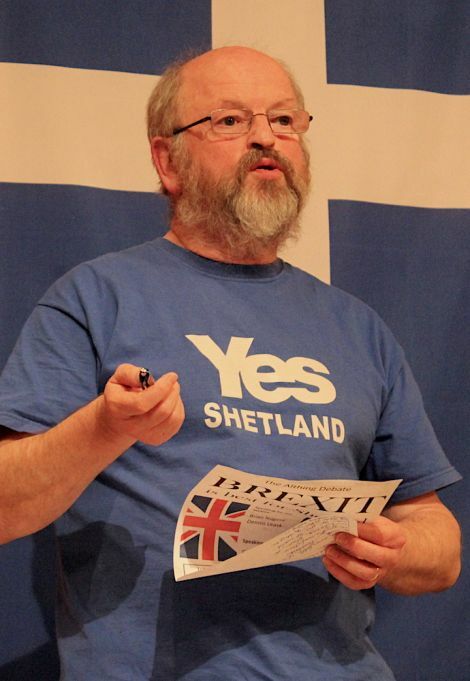 The Althing had put forward the notion that Brexit is best for Shetland and around 60 people accepted the invitation of the debating society and engaged in a lively discussion. A show of hands ahead of the presentations by four speakers showed a clear majority against the motion (nine in favour, 31 against and 18 undecided) – a result that didn’t change much after the two and a half hour long debate when 12 voted in favour and 35 against, while six still remained undecided. Speaking for the motion were Scottish independence campaigner Brian Nugent, a long-time critic of the SNP’s stance of independence in Europe, and local businessman of Fjara cafe fame, Dennis Leask. They were up against council leader Gary Robinson, who spends a lot of his working time making Shetland’s case in Brussels’ corridors of power, and pharmaceutical consultant Dr Helen Erwood, whose company advises businesses and governments on EU pharmaceutical laws. Using very often quite similar arguments either in favour of or opposed to the motion, the four speakers were however unanimous in condemning the xenophobic undertones of the EU referendum campaign and the very tangible change of atmosphere in Brexit Britain. The most powerful and profound moment of the evening came after the tea and home bakes break when several EU citizens spoke of their disgust of now living in a society where their status as citizens is uncertain, and where foreigners are being singled out as scapegoats for government failings. “I felt very welcome here,” one said. “But the attitude towards all immigrants has worsened”, another added. European citizens were also not able to vote in June’s referendum. This prompted Robinson to call on Prime Minister Theresa May to follow Scottish first minister Nicola Sturgeon and his own example to come out and state publicly “that European nationals are welcome to stay”. Going back to the papers delivered by the four speakers, the evening was kicked off by Nugent who said the EU was clearly on the road to becoming the United States of Europe, undermining the sovereignty of member states. Laws were made by unelected officials, he said, Greece was worse off after the EU had intervened and about £8.5 billion could be saved annually in membership fees, he argued. Nugent went through the history of how the UK joined the EU in the early 70s and how the UK’s territorial waters were handed over to Brussels, leaving the country’s fishermen to become “expendable”. Being worth £310 million annually, the seafood industries were four times more valuable to the local economy than the oil industry, and this could only be protected by leaving the EU. “Brexit offers a chance,” Nugent said. Quoting recent reports from the NAFC Marine Centre, which showed that half of all fish landed in Shetland were caught by non-UK boats, he said the fishing industry needed to make its case in Westminster as strongly as it could. He was later challenged by councillor Jonathan Wills, who represents the SIC on the commission of peripheral maritime regions. Dr Wills said the EU had finally woken up to the fact that the Common Fisheries Policy (CFP) didn’t work and revealed that local trawlers could lose as much as 60 per cent of their income once the obligation to land all catches comes into force. Yet, without the EU and the CFP, Shetland would be in a worse state, he argued, wondering how the local industry would fare when its exports into Europe would be levied with 11 to 18 per cent tariffs while Norway, as a member of the single market, would pay no tariffs. Robinson responded to Nugent’s opening gambit by drawing a very different picture. He said that following the Tory party conference it was now clear that the UK was heading towards a “hard Brexit”, meaning that the country would not remain a member of the common market and would also leave the customs union. Robinson said Europe had been good to Shetland over the last 40+ years, with between £800 million and £1 billion helping the local economy through monies coming in via regional development, structural and fisheries funds. And he wondered about support for the local agriculture industry, which is heavily dependent on European subsidies. There are no guarantees that any of this will be replaced by Westminster, Robinson said. Health and care services, as well as a long list of local companies such as Lerwick Fish Traders and knitwear firm Jamieson’s, would be unable to survive without Europeans being willing to make Shetland their home, he continued. “All this is being put at risk because some people think that these people take away our jobs while sponging off our benefits at the same time. Think about it,” he said. Leask, the next speaker, had a very different take. He said he wanted to pass on a strong economy to his children and didn’t see how this could be done while the UK remained a member of the EU. Describing it as the “Brussels disease”, he said the UK – and with it Shetland – was pulled down by indecision, quoting the Heathrow expansion plans and, closer to home, the long delay to get the Anderson High School built. He said it was time to accept Britain was different and would benefit immensely from being outside the EU. Then he said, it could negotiate trade deals like the Canadian CETA agreement, which imposed “virtually no tariffs” on trade. He advocated a points system for immigration and said Shetland should take people directly here and into jobs. Erwood was next, and gave some interesting insight into a little understood industry, which is the fourth largest in the UK. As someone directly involved into the licensing of medicines across the EU, her company is required to be based in the EU. As such she was forced to open an office in Cork, Ireland to protect her interests should the UK leave the EU by spring 2019 as planned. But it is not just her company that needs to at least partly relocate. Pharmaceutical companies are already planning to take their manufacturing bases to Europe, a move that could potentially cost hundred of thousands of jobs, she said. The problem with the UK was that successive governments didn’t understand Europe and were “seriously crap” in translating European directives into UK legislation, Erwood said. This point was further highlighted after the break when Andrew Blackadder spoke of his 30-year long experience of structural funds negotiations with UK governments and European administrations. “The UK government doesn’t understand how to negotiate with Europe. It is appalling. Shetland has benefited significantly despite the UK government,” he said. Erwood also referred to a recent figure from the council’s head of development, Neil Grant, who had estimated that Shetland would lose out to the tune of between £20 to £30 million annually. “That is up to £3,000 less for every household in Shetland”, she warned. And, quoting from a recent Scottish government report, she added that Brexit would make the UK and Scotland less attractive, meaning locally poorer roads, fewer ferries, school closures, depopulation, higher transport cost and a more expensive NHS.